In 1769, Pierre Loramie came to the Ohio Country as one of its earliest European settlers. Formally a citizen of France who lived in Canada, Loramie became an English citizen with the Treaty of Paris (1763). The English defeated the French in the French and Indian War. As a result, France relinquished all of its lands in North America to the English. Its citizens now became English. Loramie's exact reasons for coming to the Ohio Country are unclear. He may have been a religious missionary seeking converts among Ohio's American Indians, a merchant seeking his fortune from the fur trade, or an agent dedicated to keeping a French presence north of the Ohio River. Upon arriving in the Ohio Country, Loramie constructed a trading post on the portage between St. Mary's River and modern-day Loramie's Creek in Shelby County, Ohio. American Indians commonly traveled this route as they moved south to the Great Miami River and then into southern Ohio and Kentucky. The Shawnee were especially frequent visitors to the outpost. 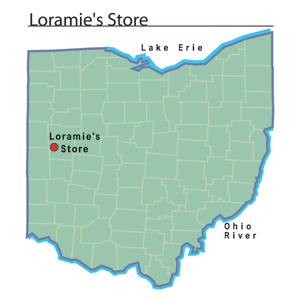 During the American Revolution, American Indians loyal to the British used Loramie's Store as a staging area for attacks against the Americans. In 1782, George Rogers Clark, during a raid against the Shawnee, dispatched Benjamin Logan to destroy the trading post. Logan succeeded in this mission. With his trading post lost, Loramie moved west with a band of Shawnee. The site remained abandoned until 1795, when Anthony Wayne ordered the American military to construct a blockhouse and a few additional buildings for storage. He named the site Fort Loramie. Eventually, Fort Loramie evolved into a village as settlers moved into west central Ohio to take advantage of the fertile land available for farming.